SEM. 16 Jul 2011. F.A.S. Sterrenburg. © F.A.S. Sterrenburg. Published in: Rabenhorst, L. (1853). Die Süsswasser-Diatomaceen (Bacillarien. ): für Freunde der Mikroskopie. pp. i-xii, 1-72. Leipzig: Eduard Kummer. The type species (holotype) of the genus Gyrosigma is Gyrosigma hippocampus Hassall. Participle A (Latin), acuminate, i.e. tapering gradually or abruptly from inwardly curved sides into a narrow point (Stearn 1973). Valve moderately sigmoid, slender to somewhat more broadly lanceolate with fairly obtuse or subacute ends, 70-180 µm long, 12-24 µm wide. Raphe sternum with minimal double curvature, almost straight for half its length, practically median except slightly eccentric near the ends, raphe angle +3 to +8 degrees. 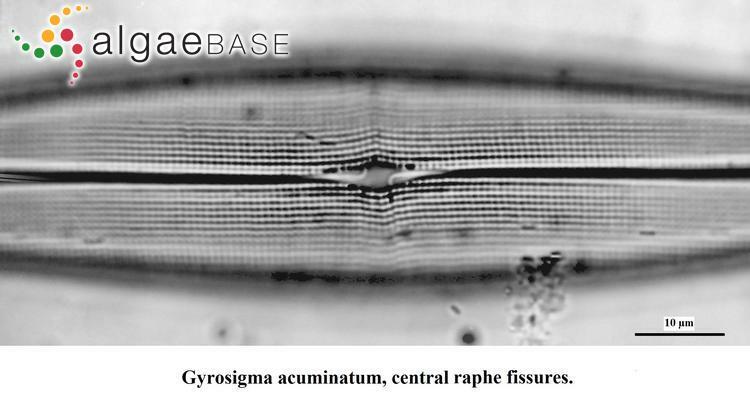 Central raphe fissures crook-shaped, oppositely deflected to either the convexity or concavity of their raphe sternum (dimorphic deflection type). Central area oval, not rotated. Terminal areas unilaterally dilated funnels in semilateral position. A crescent of minute apical microforamina runs around the apex in the hyaline terminal area, at the limit of visibility in the LM. 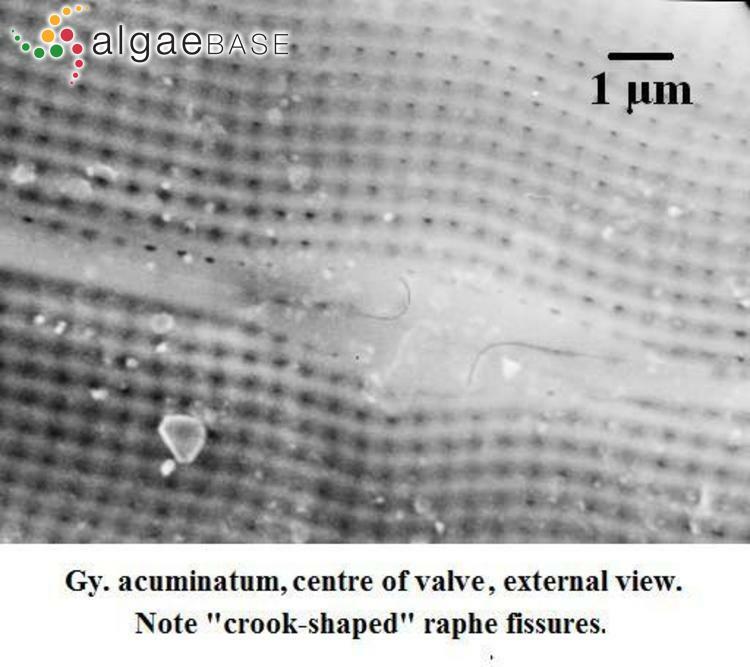 Longitudinal striae 19-24 in 10 µm, markedly closer together at the margin of the valve (SEM), transverse almost equally fine or very slightly coarser. 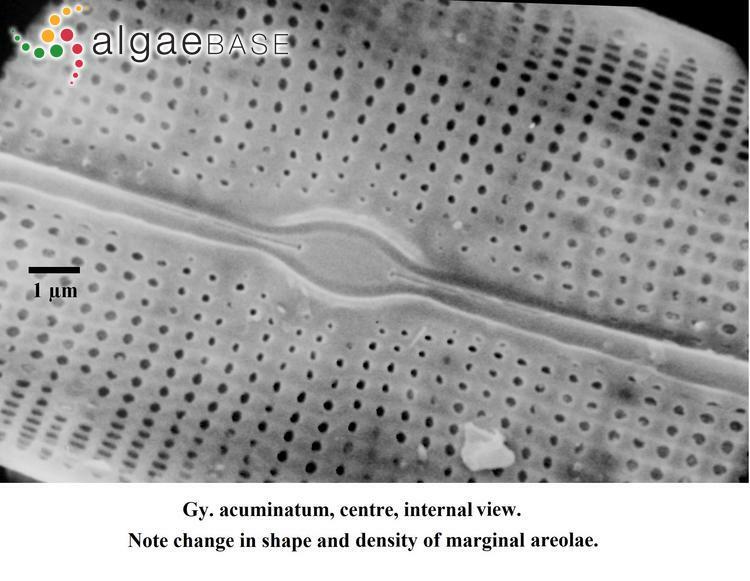 Very common in fresh to very slightly brackish waters, probably cosmopolitan and personally (Sterrenburg) observed in samples from Europe, the USA, New Zealand and South Africa. Buczkó, K., Ács, É., Báldi, K., Pozderka, V., Braun, M., Kiss, K.T. & Korponai, J. (2019). 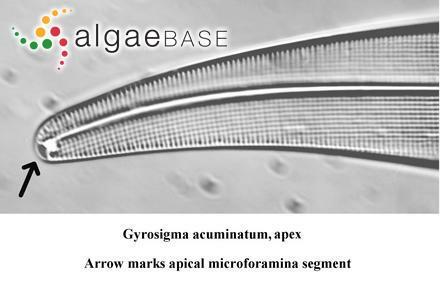 The first high resolution diatom record from Lake Balaton, Hungary in Central Europe. Limnetica 38(1): 417-430, 4 figs. John, J. (2018). 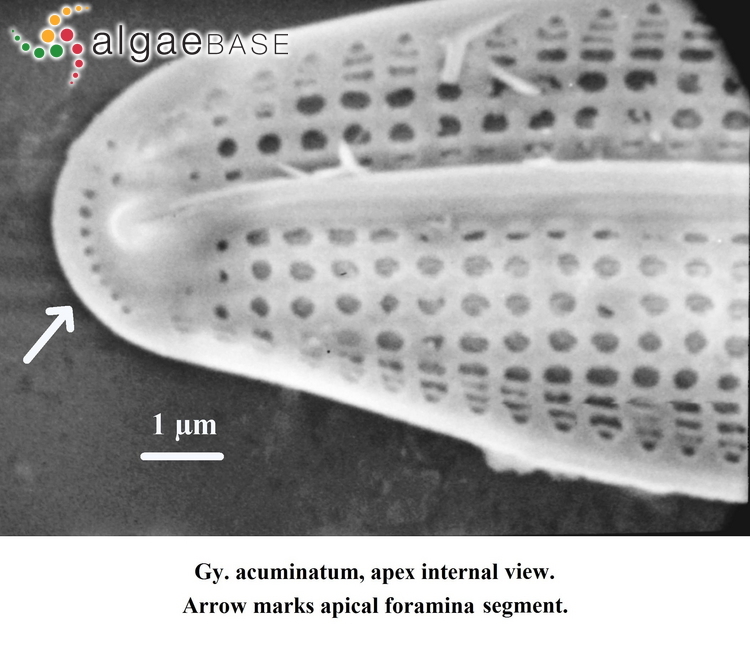 Diatoms from Tasmania: taxonomy and biogeography. The diatom flora of Australia Volume 2. pp. -656, 351 figs. Schmitten - Oberreifenberg: Koeltz Botanical Books. Reichardt, E. (2018). Die Diatomeen im Gebiet der Stadt Treuchtlingen . pp. Band 1 -576; Band 2: 579-1184, incl 451 pls. München: Bayerische Botanische Gesellschaft [Selbstverlag der Gesellschaft]. Accesses: This record has been accessed by users 7911 times since it was created. Sterrenburg, F.A.S. (1995). 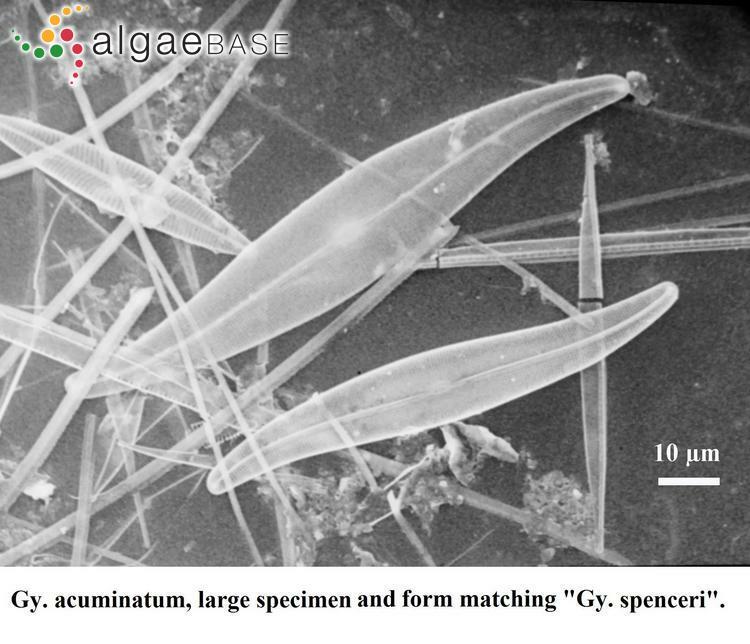 Studies on the genera Gyrosigma and Pleurosigma (Bacillariophyceae). Gyrosigma acuminatum (Kützing) Rabenhorst, G. spenceri (Quekett) Griffith et Henfrey and G. rautenbachiae Cholnoky. Proceedings Academy of Natural Sciences of Philadelphia 146: 467-480.